Hoxton Square Bar and Kitchen is exactly what it says it is – a trendy eatery and late night lounge bar in north London’s Hoxton Square. Having taken over what was the Lux cinema next door to their original bar, Barworks (the holding company) has converted the front half of the building into a trendy restaurant, and the back half into a multi-purpose bar/music room whilst retaining the original bar at the side. With a distinctly post-modern, industrial feel – bare, unfinished walls, dark walls and squashy black leather sofas – the new music venue fits right into the Hoxton Square scene. 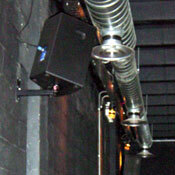 Barworks turned to audio and lighting specialists Sound Division to design, supply and install the audio system. Sound Division already has plenty of experience in Hoxton Square, having installed Shish last year and continuing to look after regular clients Traffik and 333 Club. 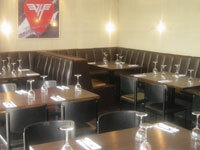 The brief for Hoxton Square Bar & Kitchen was to supply a high quality background audio system for the restaurant while the music room at the back required a system that would handle deliver high quality background music for daytime and evening use during its function as a bar, but had the residual power and headroom to deliver much higher volumes for the weekend club nights. Furthermore the system needed to be zoned in such a way as to enable the DJ to be fed through to the restaurant and original bar when necessary, or to run the three areas from separate music sources including MP3. Sound Division’s Elliot Patterson opted for a Crown-driven Turbosound system throughout. The restaurant system is based around Turbosound Impact 50 loudspeakers powered by a Crown XLS 402 and controlled by a Cloud CX133 dual zone mixer, complemented by a Pioneer PDM603 6-disc multiplay CD player. The bar/music area is equipped with Turbosound TXD-121 600W mid/hi cabinets and a TXD-215 1200W sub for the low frequencies driven by a combination of Crown XS900 and XS500 power amplifiers. System management comes courtesy of a DBX drive rack processor. The DJ booth is equally well equipped with Technics SL1210mk5 turntables, Ortofon Cartridges, a Denon DND4000F Twin CD player and a Pioneer DJM500 mixer.